Zara is searching for who messaged Alina. Zeenat is putting mehndi in Alina’s hands for wedding. Ayesha brings jewelry for her. Zeenat asks her to apply mehndi. Ayesha says I wanted a big function on her wedding and this is happening like this. Zeenat says we cant have grand wedding because then Irfan’s lie will come out. Ayesha says if he doesnt think about us then why should we? Kabir comes there and says no, he did this to save Alina’s life, Irfan’s life cant be in danger. Ayesha says a daughter can destroy our lives for her father. Zara gets call and says okay. Zara says soon I will find out who messaged Alina. Kabir says thats not your issue. Zara is worried and says Alina loves Amir so why Kabir is forcing her? I have to find out if Amir and Alina really love each other or are just emotional. Zara meets Amir and says I am sorry for what Kabir did, he was just worried for Alina. Amir says its okay, if he didnt beat me then I wouldnt realize that I love Alina. Zara says does she love you? Amir says she does, she was ready to runaway with me for one message, this is love, I want to marry her, will you take my side? Irfan comes to Shahbaz’s house. Shahbaz thanks Irfan for saving Alina’s life. Shahbaz says we are doing this wedding silently so Irfan will not be in danger. Zara asks Amir if he loves her because she is from a rich family? Amir says my sister was forced to marry someone, loving someone is not about money for me, he shows her uniform and says I can swear on this that my love is pure. Zara smiles and says now I am sure, dont worry. Ayesha says to Salma that Zara is always against Kabir, if Anas and Alina’s marriage breaks then Kabir and Zara’s relation will be in danger too. Zeenat says to Kashan that soon we will bring out Irfan’s truth out and then he will leave his head priest position and we will appoint someone from our people. Kashan says we will not distribute cards in city as anyone can tell Shahbaz, we will invite people on call for Amir and Alina’s wedding and when they see Anas, Irfan’s truth will come out. Zara comes to her room. Kabir asks where did she go? Zara says I went to meet Amir, its his goodness that he didnt raise voice against you beating him. Kabir says so? he tried to provoke my sister, if I find out that he messaged Alina then I wont spare him. Zara looks on. Kabir says you worry about Amir too much? Alina is getting married and nobody can stop this wedding. Zara says you are too egoistic, she is sacrificing for her family like all others, give Alina a chance. Kabir says Amir cant take care of Alina. Zara says why? he doesnt have one arm? Kabir says no. Zara says money is not everything. Kabir says she is a good family. Zara says this is 2019, girl doesnt have to sacrifice her whole life for her family’s happiness. Alina hears all that. Zara says to Kabir that if Alina tells me that she wants to marry Amir then I wont let injustice happen with her. Kabir says you will go against me? Zara says forcing a girl to marry someone is a sin and I want to save my husband from doing this sin. She leaves. Alina looks on. Alina comes to her room and recalls Zara’s words. She says why cant I tell them that I dont want to marry Anas? She breaks things. Zara comes there and says what are you doing? alina says I dont know what to do. Zara asks her to do isthikhara, pray to God and he will give you a hint. 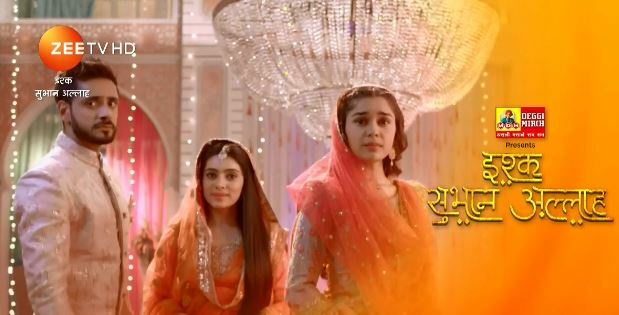 The post Ishq Subhan Allah 22nd February 2019 Written Episode Update: Zara decides to go against Kabir appeared first on Telly Updates.